St. James Episcopal Church is located at 622 S. Main Street. Click here to open our location in Google Maps and create directions. See above for a map of our parking areas. Most handicapped parking is located at the front of the church, on the west side. 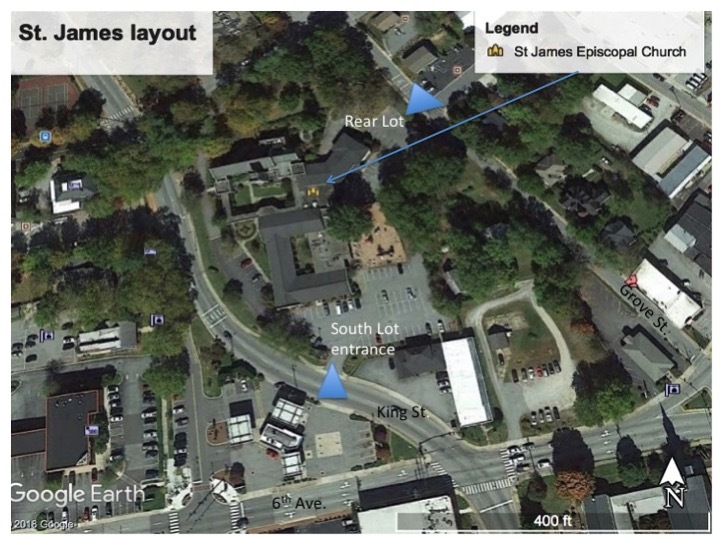 For Thrift Shop parking, use the church's rear lot, off of North Grove Street. Each of the weekday services is unique, offering worship and prayers to our diverse community. Our weekday services are from the 1979 Book of Common Prayer. They are held in the St George Chapel. All weekday services are without music.